I’m still making my way through my Candles With Character haul from last year, not that I’m at all complaining, I plan on doing another one later in the year when Lyn releases her fabulous Autumn/Winter and Christmas scents. I haven’t burned one candle yet that I haven’t really and truly loved. You can read all of my previous reviews HERE. 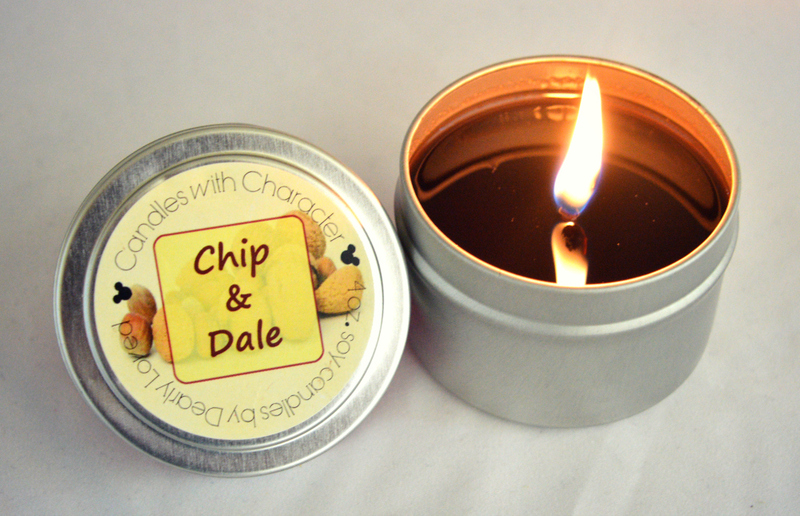 Chip and Dale have scampered your way, in search of tasty nuts to take back to their home! The scent of this candle is delicious, toasted hazelnut. It smells like a decadent and luxurious nutella. It’s has the nutty aroma of hazelnuts but with added creamy butter and rich vanilla elements. It’s just all kinds of yummy! All Candles With Character candles are made with soy wax and are hand poured into a lidded and footed tin and crafted with quality products. All my Candles With Character have burned so well, so clean and so evenly and they an amazing scent throw. I always keep my wicks trimmed so that I can get the most out of them, if you do that I’d say you’d easily get twenty plus hours out of one of these 4oz. candles. Check out My Dearly Loved on Etsy for lots of fabulous candles, wax melts and other Disney related goodies and be sure to follow them on Facebook, Instagram and on Twitter and stay tuned for more review from us.